When we want to submit the request/concurrent program from the back end, then we use this API. Application, --> we have to pass the short name of the application concurrent Program in which we registered (Ex: Oracle Receivables = AR). Sub-request, --> if there any other request, pass true other wise false. Arg-1, --> these arg1 to arg100 are used to pass the parameters to the concurrent program. 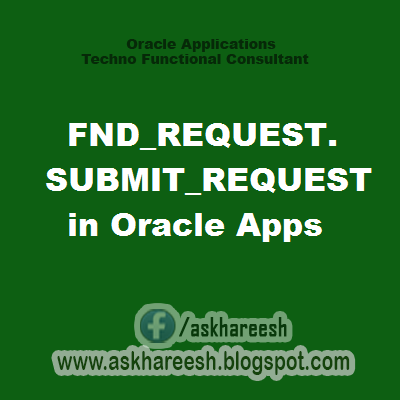 Totally, 105 parameters are in FND_REQUEST.SUBMIT_REQUEST API .